Marvel's Infinity War is already considered one of the most highly-anticipated movies of the year, and as fans await the next trailer dropping tomorrow, directors Anthony and Joe Russo shed new light on this blockbuster-to-be. When the movie was first announced at a Marvel press event in October 2014, which laid out the entire Marvel Phase 3 slate, it was revealed that the third and fourth Avengers movies will be Avengers: Infinity War - Part 1 and Avengers: Infinity War - Part 2, but that was later changed, with the first movie now titled Avengers: Infinity War and the Avengers 4 title yet to be revealed. During an interview on the set of Avengers: Infinity War, The Russos revealed why the project shifted from a two-part story to being two completely separate movies. Here's what Joe Russo had to say, revealing that Avengers 4 is more of a sequel to Avengers: Infinity War, as opposed to being the second part of the same story. "It's simply the same thing in the way that The Winter Soldier relates to Civil War' and the way that Civil War relates to Infinity War. These two movies will also relate, there's a narrative thread that is connecting these films, but at the same time, there's an independence in terms of what the experience is or where the story goes. It isn't a true two-parter, and I think the two-parter concept came back when Marvel decided they were going to culminate the MCU, it was going to be a two-movie deal. But as we developed the movie, in execution, it ended up being more of two singular expressions." Joe Russo also compared Avengers: Infinity War and Avengers 4 to the two movies that started the trend of splitting the final movie in half, Harry Potter and the Deathly Hallows. The decision to split that massive novel into two movies started a brief trend of splitting the final novel of franchise finales in half that was used by the Twilight, Hunger Games and other franchise. 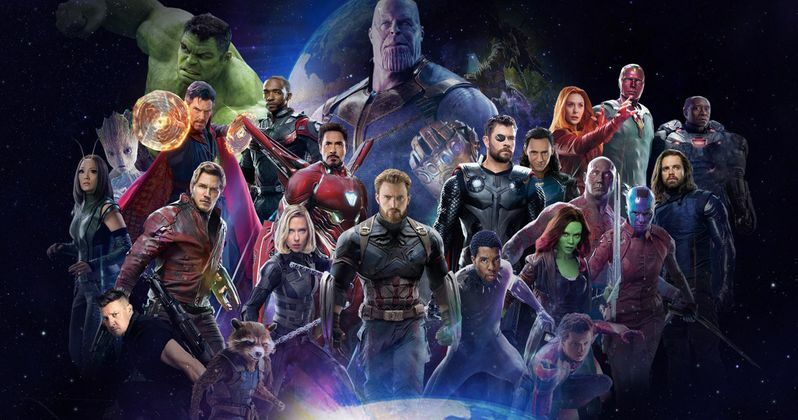 Joe Russo added that this is much different than the Harry Potter stories, which was a "distinctive story" told over a set amount of movies, while this type of story has to keep evolving, teasing Avengers: Infinity War and Avengers 4 will have different heroes at the forefront of each story. "We always try to make each film different so they don't get repetitive. This kind of serialized storytelling, outside of Harry Potter which was a distinctive story that was told over that eight movies, you have to keep evolving. You have to keep evolving who's at the forefront, how you're laying the story out, because I think rigor mortis will set in very quickly. So for us, we absolutely are very, very particular about who carried the ball on this movie, and who will carry it on this movie because each character represents a different theme, each character has different wants, and that can shape and color and re-tone an entire film depending on who you're following. Especially in stories this big." Many are still wondering what the official title for Avengers 4 will be, and since it has been confirmed that the Avengers 4 title is in fact a huge spoiler for Avengers: Infinity War, it's possible that the Avengers 4 title will be revealed during the end credits of Avengers: Infinity War. Regardless, Avengers: Infinity War is expected to get the summer movie season off to a big start, although Marvel made some surprising headlines when it unexpectedly moved the release date from its traditional spot of the first weekend in May (May 4), the unofficial start of the summer movie season, to the last weekend in April (April 27), long considered to be one of the weakest box office weekends, until now. The Russo's revealed these new details during an on-set interview with Coming Soon.